The standard edition of his philosophical and theological works is William of Ockham: Opera philosophica et theologica, Gedeon Gál, et al., eds. 17 vols. St. Bonaventure, N. Y.: The Franciscan Institute, 1967–88. For his political works, all but the Dialogus have been edited in William of Ockham, H. S. Offler, et al., eds. 4 vols., 1940–97, Manchester: Manchester University Press [vols. 1–3]; Oxford: Oxford University Press [vol. 4]. Summa logicae (c. 1323), Paris 1448, Bologna 1498, Venice 1508, Oxford 1675. Quaestiones in octo libros physicorum (before 1327), Rome 1637. Summulae in octo libros physicorum (before 1327), Venice 1506. Expositio aurea super artem veterem Aristotelis, 1323. Quodlibeta septem, Paris 1487, Strasbourg 1491. De sacramento altaris and De corpore christi, Strasbourg 1491, Venice 1516. Dialogus* (begun in 1332) Paris 1476. Lyons 1495. Epistola ad fratres minores (1334). ^ William Turner (1913). 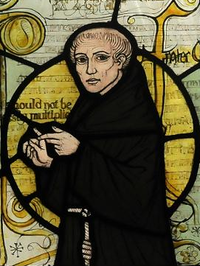 "William of Ockham". In Herbermann, Charles. Catholic Encyclopedia. New York: Robert Appleton Company. ^ Russell, Bertrand (2000). History of Western Philosophy. Allen & Unwin. pp. 462–463. ISBN 0-415-22854-9. ^ W. M. Thorburn (1918年). “The Myth of Occam's Razor”. Mind 27 (107): 345–353. doi:10.1093/mind/XXVII.3.345. http://en.wikisource.org/wiki/The_Myth_of_Occam%27s_Razor 2006年10月25日閲覧。. ^ In his Summa Logicae, part II, sections 32 & 33. ^ William H. Watts and Richard J. Utz, "Nominalist Influence on Chaucer's Poetry: A Bibliographical Essay," Medievalia & Humanistica 20 n.s. (1993), 147–73; Helen Ruth Andretta, Chaucer's 'Troilus and Criseyde.' A Poet's Response to Ockhamism (New York: Lang, 1997). Adams, Marilyn (1987). William Ockham. Notre Dame: University of Notre Dame Press. ISBN 0268019401. Beckmann, Jan (1992). Ockham-Bibliographie, 1900–1990. Hamburg: F. Meiner Verlag. ISBN 9783787311033. Freppert, Lucan (1988). The Basis of Morality According to William Ockham. Franciscan Herald Press. ISBN 9780819909183. Knysh, George (1996). Political Ockhamism. Winnipeg: WCU Council of Learned Societies. ISBN 9781896637006. Panaccio, Claude (2004). Ockham on Concepts. Aldershot: Ashgate. ISBN 9780754632283. McGrade, Arthur Stephen (2002). The Political Thought of William Ockham. Cambridge University Press. ISBN 9780521522243. Spade, Paul (1999). The Cambridge Companion to Ockham. Cambridge: Cambridge University Press. ISBN 052158244X. Wood, Rega (1997). Ockham on the Virtues. Purdue University Press. ISBN 9781557530974.